David Fincher is the man who gave us Fight Club, Panic Room, The Curious Case of Benjamin Button and The Social Network. While all these are critically acclaimed films, Se7en is probably his best work to date. 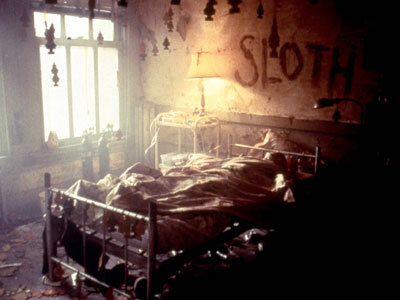 Se7en is a grisly, dark and horrifying thriller that grips the viewer from beginning to end. It is disturbing to the point of being hard to digest for most people. It tells the story of two detectives, one on the verge of retirement (William Somerset, played by Morgan Freeman) and the other at the start of his career (David Mills, played by Brad Pitt). They are partnered for their first case together, to investigate a series of killings based on the seven deadly sins. The movie’s opening credits are set to a remix of Nine Inch Nails’ “Closer”, which sets the depressing mood for the film. The movie constantly sends shivers down the viewer’s spine, depicting the grisly murders based on the Sins. A fat man is forced to eat himself to death (for the crime of Gluttony), a model’s face is disfigured and she is given a choice between help and suicide (for the crime of Pride at her own beauty), another man is barely kept alive for an entire year (Sloth). 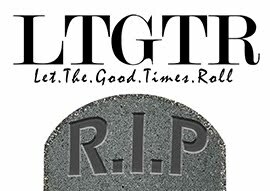 Lust and Greed have equally disturbing murders to their names. These scenes are about as graphic as a commercial film would allow, and are certainly not for the faint hearted. As the story progresses and the detectives get closer to the killer, the feeling of tension becomes stronger. The scene where the killer’s books and notes are revealed is spine-chilling, offering an insight into the his twisted mind. In the midst of these scenes, there is a faint glimmer of hope in the scenes involving Mills’ wife (Gwyneth Paltrow) confiding in Somerset. These scenes flesh out both characters wonderfully, and Morgan Freeman plays his role to perfection, showing why he is one of the top actors in the world today. Brad Pitt, Gwyneth Paltrow and Morgan Freeman have put in top performances for this film. The entire film is brilliant; however, the final half-hour will simply blows you away. The hunted serial killer (an uncredited role) makes an appearance with a role that makes Pitt and Freeman look small. He carries the rest of the film on his shoulders. He is revealed as a scarily twisted psychopath with an equally twisted plan for the finale. The ending is one which should not be missed, and definitely goes down as one of the greatest in movie history. 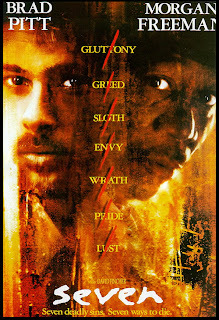 In all, Se7en is a scary, twisted but nonetheless brilliantly-made film that is a must-watch for any movie fan. Watch this one from beginning to end without any breaks, for that is how it is meant to be watched. It will leave you in awe.